My family and I moved back to California from Colorado in June. I was ecstatic to be back in the Sacramento Valley where I grew up, but one concern became obvious as we settled in. Water. There is so. much. water. Yes, we’re going through a drought, but even then, relative to most other areas of the country, there are so many places available to Northern Californians to swim or participate in activities in, or around water. I have 3 very adventurous boys, aged 6, 4, and 2. I realized quickly that swimming lessons were very necessary. My boys looked forward to swim lessons. 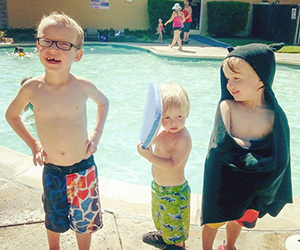 They loved swim at Cal Fit Arden, and it was the highlight of their day. 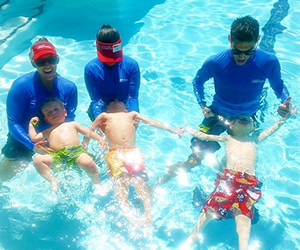 They went inside the front doors and straight up to the front desk with excitement, ready to start their swim lessons, but not before finding Ms. Courtney, the Child Care and Pool Manager. She always greeted the boys with a big smile and asked them how their day was and they’d chat with “their Ms. Courtney,” then, they’d head off to the pool, ready for swim. Luke, my 6 year old (who had brain surgery in April of this year) had swim lessons with Zac. Zac did such a great job showing patience and also altered his teaching style to connect better with Luke, who struggles with low muscle tone, and coordination. For example, when Luke struggled to properly execute his arm strokes, Zac prompted Luke to “zip up” and showed him an imaginary zipper up his sides. This creative adjustment helped Luke tremendously. By mid-Summer, my Luke was back floating, swimming, circle swimming, and diving. I can’t tell you how much of a relief it is to know that Luke has these core skills and is so much safer around water. Kai, my 4 year old, was paired up with Ms. Nadia, who was very nurturing and encouraging. Being a middle child, he thrived on the one-on-one attention that he was getting in private lessons and began swimming very quickly. He was “a natural” in the water, so she did a really great job of continuously challenging him to improve. I don’t think I saw a time where Kai or Ms. Nadia weren’t having fun while they worked on various new challenges. My almost 2 year old, Carson was extremely fond of water, which sounds like a good thing and for the most part it was. The big problem with a toddler that wants to be in the water 24/7 is that he doesn’t consider safety before running towards it. Given that, we focused on his back floating, water safety and other water survival skills. I still can’t believe at two years old, he can pull himself out of the water in the deep end of a pool, or turn to his back and float if he were to fall in. Ms. Krista also started transitioning him with glides to introduce future technical swimming in addition to achieving his other goals. I highly recommend Cal Fit swim lessons for any parent who is looking for a swim school that teaches sound technical swimming in a way that can engage multiple ages and personalities. We will definitely continue swim lessons at Cal Fit. On an even more important note the Cal Fit Arden staff: They are amazing. A gym, or any other business really is only as good as its employees. Courtney, the Child Care and Pool Manager really loves her job and it shows. She knows so many of the kids that go through those doors. Kristi did a really great job of making sure things are running smoothly as the vibe in the gym was always very positive and inviting. My boys became very familiar with them, among many other smiling faces like Lauren and Cedrick. Picking up a snow cone at the front desk after swim became part of our daily swim lessons routine over the summer. As a parent, it’s very comforting seeing competent, and caring staff members that engage with your kids in such a positive way.